Arpit joined LEAD Team at Ek Soch Sandbox in 2016. Well-coordination and management skills helped to establish himself as Operation Head of Ek Soch. He looked after all the activities and events for not only LEAD but also for all the programs and partner NGO of Ek Soch Sandbox. He also mentors the students in the LEAD program. 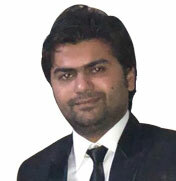 He is well known for event management as result of being part of Ek Soch. He has good command and link over the market because of his family business.